So ‘the big game’ is coming up and you’ve got some people coming over to your house early for a pregame party complete with libations and snacks- are you ready?! What better way to combine a traditional brunch/lunch cocktail alongside a huge assortment of great snacks than a Bloody Mary. 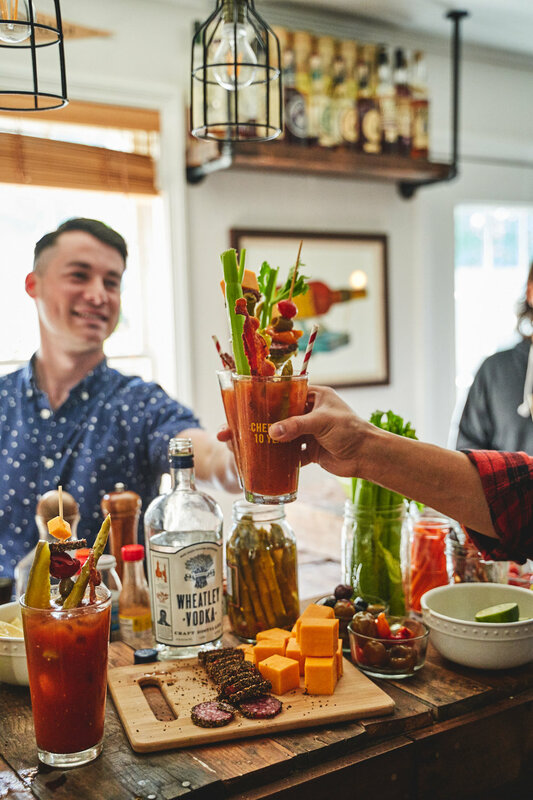 Thats why I’ve partnered up with Wheatley Vodka to not only teach you how to make your own, delicious Bloody Mary mix from scratch; but also how to set up the perfect Bloody Mary bar to impress your guests and get them ready to watch the Super Bowl! Full disclosure: this post is sponsored. If you haven’t heard of Wheatley Vodka, I’m happy to be the one to introduce it to you. Raise your hand if you’ve heard of the following bourbons: ‘Pappy Van Winkle’?… OK, now what about W.L. Weller?… if you raised your hand twice, thats a little strange, but you most likely know good bourbon. You probably also know that these two great “wheated” bourbons are created at the same distillery and use almost the same mashbill right down to the same corn and wheat that make them such prized, sweet bourbons. Thats right, the Buffalo Trace Distillery with Master Distiller, Harlen Wheatley at the helm, is the source for these and many other fine whiskies such as Eagle Rare, Col. E.H. Taylor, and their flagship bourbon; Buffalo Trace, just to name a few. What you probably didn’t know is Harlen Wheatley had a passion project on the side, he wanted to create a vodka using red winter wheat known for its sweetness after distilling as well as limestone water, common to most bourbons distilled in Kentucky; it was aptly named ‘Wheatley Vodka’. Does the ‘red winter wheat’ variety sound familiar? If it does, its because its the same wheat used in the mashbill for Buffalo Trace’s wheated-bourbon lines. Yes, that means Wheatley Vodka uses the same wheat (and water!) found in Pappy Van Winkle and W.L. Weller. After being distilled TEN times, it produces a vodka that has a subtle sweet and clean finish and is PERFECT for a bold, spicy Bloody Mary Mix. Now back to Bloody Marys… First of all, I want to be clear that there is certainly nothing wrong with having your favorite brand of pre-made mix. In a pinch, I do have a local favorite mix that I use if I’m running short on time, its easy and does the trick. However, if you yet to make your own mix from scratch, I urge you to try it just this once! Theres something to be said about crafting your own Bloody Mary mix with FRESH ingredients and made to your taste and liking. What better time to try making your own than at your pre-Super Bowl party to impress those cocktail minded friends of yours, right? Alongside my personal Bloody Mary recipe, you’ll find instructions on how to make a single serving or a batched version that will knock your socks off (recipe below). Next you’ll find my suggestions on the perfect toppings/fixins that I made and served during my party. You’ll want to do most of your prep the night before so you all you have to do the day-of is just plate and serve your offerings. Unless you’ve got a knack for pickling, save some time and buy some premade pickles at your local store or supermarket, theres a large variety these days, so go crazy (full list below). Also, go ahead and cut the celery, cheese(s) and meat(s), then store them in the fridge for easy presentation the next day. If you’re planning on making bacon (this is a must-have IMO), go on to the next section. Always buy a whole celery stalk, its more cost effective and its long enough to stir your Bloody Mary. I personally like making the mix the day of the party (see recipe below) - the big secret to amazing mix is using freshly squeezed citrus, so skip the yellow/green concentrate - trust me on this. You can absolutely make this the night before too, but theres just something to be said about freshly squeezed lemons and limes in a Bloody Mary. As far as bacon goes, save some time by baking your bacon - they turn out perfect for me every single time and you can make them in batches as well with little to no supervision. This is also a good time to start plating your fixins, simple bowls will do, I also love the look of mason jars for the longer items like the celery, bacon and asparagus. This is your chance to get creative with your presentation for the Bloody Mary bar! Once your guests arrive, you’ll have to play host but your free time will be dependent on whether you batched your Bloody Mary or are making single servings. Before you ask, yes, single servings are tedious, but tastes so much better and gives you an opportunity to tweak each cocktail to your guests’ liking - plus it gives you the opportunity to show off your bartending skills. Do they want it stronger? Add more vodka. Spicier? Add more horseradish and hot sauce. Heck, make it an interactive experience - have your guests get ‘behind the bar’ and use the shaker to shake their own drinks, this has gotten a great response from my guests in the past and I’m sure yours will get a kick out of it too (hey, less work for you, right?). The beauty about the concept of a Bloody Mary bar is that you’ve already done most of the work - have your guests customize their own and create their own twists on the same cocktail. Its a fun, social and interactive experience for all. Now just sit back, relax and enjoy your own and wait for that game to start! Cheers y’all! Except for the vodka and horseradish, add all Bloody Mary mix ingredients into a large serving vessel or pitcher. Stir all ingredients until well incorporated - this will be your Bloody Mary base. 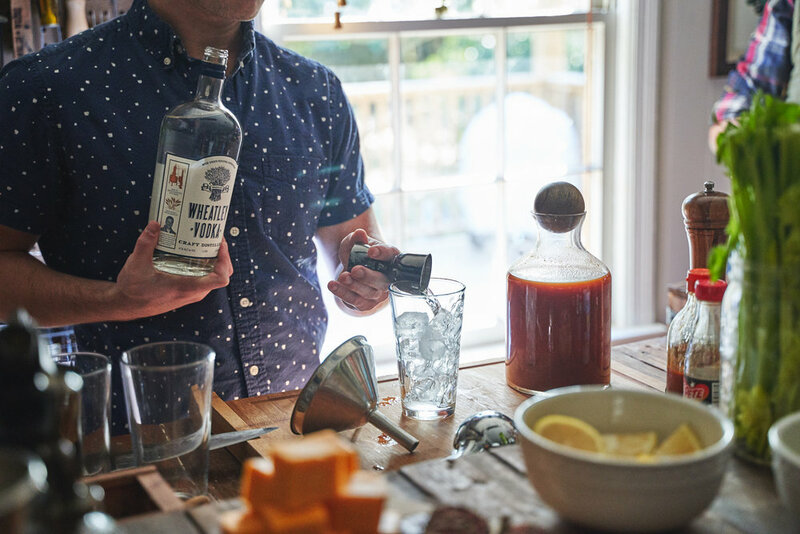 For one serving, add 1.5 oz of Wheatley Vodka and 4 oz of your homemade Bloody Mary mix to a shaking tin (if you’re like me and want to add a bit more of a kick - add another bar spoon of horseradish and 2 dashes of hot sauce). Add ice and shake for 5 seconds until the drink is well incorporated. Pour into a pint glass filled with ice - leave some room for the fixins. Have each person customize their own Bloody Mary! Use the bamboo skewers to layer ingredients into the cocktail. Add all Bloody Mary mix ingredients (including vodka) into a large serving vessel or pitcher. Stir or shake all ingredients until well incorporated - refrigerate overnight. Pour into a pint glass filled with ice - leave some room for the fixing. Certain links above can be affiliated, meaning at no additional cost to you, I could potentially earn commission for each purchase. If a post is sponsored, this means I was compensated to research, develop and photograph a custom recipe on my own. Thanks y'all!